Ponderosa pine is native across much of the western US and reaches eastward into western Nebraska. It is a fairly fast-growing tree and has been a popular choice across the state for windbreaks and general landscape use. Nebraska is the easternmost extent of the tree's native range with trees growing along the Niobrara river as far east as Keya Paha county and south to Custer County. 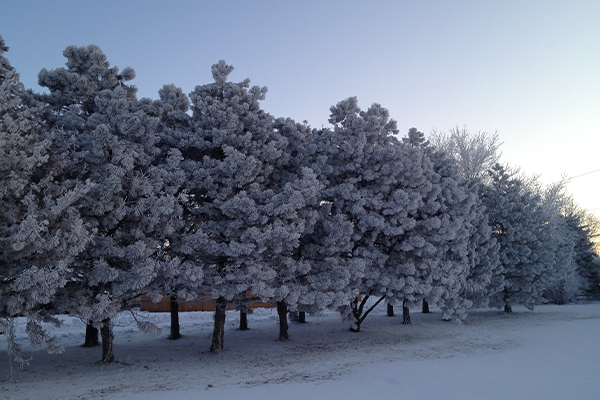 The tree does well across the state but can struggle with needle diseases in the higher humidity of eastern Nebraska. Ponderosa pine prefers light, moist soils with good drainage. It does poorly on heavy soils especially under heavy irrigation. It is drought tolerant when established but has no tolerance for shade. 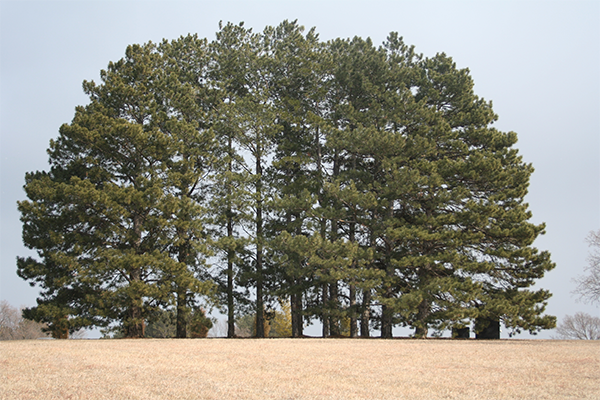 Ponderosa pine does well in tightly-spaced windbreaks of western Nebraska but will benefit from open gaps in the higher humidity of eastern Nebraska. Ponderosa pine makes a good specimen tree and with age can become a nice shade tree when properly managed. Ponderosa pine is a wide-ranging species often divided into several sub-species depending on the region they grown in. Nebraska’s native trees are considered a separate sub-species by some taxonomists. Often a long-lived species, trees are typically broadly pyramidal when young becoming rounded with age and reaching 50 to 90 feet tall at maturity. The needles are longer than other species in our region, often reaching 5-6” long with 3, but sometimes 2-4 needles in a cluster (bundle). The needles usually remain on the stem 3 to 4 years with the major needle drop in September and October. The cones are pineapple-shaped, 3 to 6 inches long, and take 2 years to mature. The cone scales terminate with a sharp barb. The bark is dark brown to nearly black when young turning an attractive cinnamon brown to orange-yellow with age. This tree has a deep taproot except on shallow soils where roots often follow cracks for a considerable distance. The seeds of ponderosa pine are the choice food of small animals and a wide variety of birds including red-winged blackbirds, chickadees, mourning doves, finches, evening grosbeaks, jays, Clark's nutcrackers, nuthatches, white-throated sparrows, rufous-sided towhees and turkeys. The pine needles are an important food of blue and spruce grouses. The pine bark is fair food for beavers and is used by porcupines which sometimes damage the trees. Nuthatches dig nest holes in dead trees. When well sited and cared for, ponderosa pine has few major pest or disease problems. It can suffer from needle blight diseases in the more humid parts of the Midwest. It is generally considered a better adapted to western Nebraska than eastern. Lodgepole pine (Pinus contorta) is a fairly common pine of the central and northern Rockies, reaching to the Pacific Northwest. The common name refers to its use as structural poles for Native American tipis. Great Plains tribes traveled long distances to obtain the poles from the mountains, including along the Lodgepole Creek valley in Nebraska’s south Panhandle. The species name contorta derives from the bent trees found in coastal areas as well as its twisting (contorted) needles. Lodgepole pine often occurs in dense stands of very upright trees in the central Rockies and requires occasional fire for seed dispersal and to open habitat. The tree is sometimes encountered in the Panhandle but has become highly susceptible to mountain pine beetle in its native range, possibly as a response to a warming climate. The tree is not recommended for widespread use but could be considered for an occasional landscape planting in the higher elevations of western Nebraska. Native Americans used various parts of ponderosa pine for medicinal, building and household, food, and ceremonial purposes. Ponderosa pine is the second tallest growing species in North America with some specimens reaching over 250’ tall.